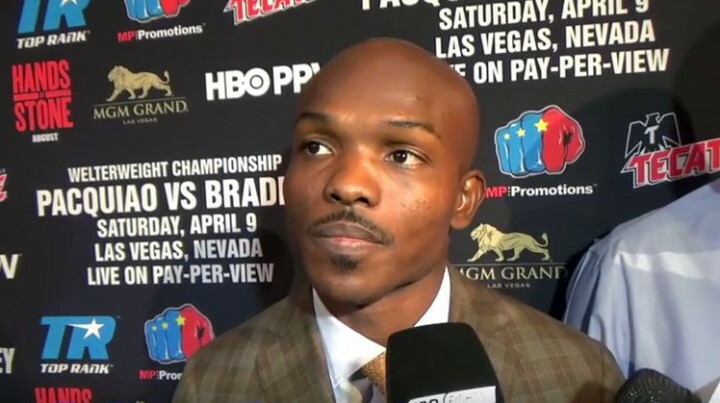 By Sean Bastow: Our final retirement in the world of boxing this past week is that of Timothy Bradley. He made his announcement whilst working as a commentator for the Vasyl Lomachenko vs Miguel Marriaga fight this past weekend. We pay homage to Bradley’s career this evening with a quick snapshot his rise to world level and the fights and potential fights he should have been involved in. Tim Bradley started his career back in 2004 and quickly rose the rankings, picking up his first professional title after nine bouts. It was eleven bouts and five defenses of the WBC Youth World Super Lightweight title before he had earned the right to fight for the WBC Super Lightweight title against the UK’s own Junior Witter. The fight with Witter took place in Nottingham on the 10th May 2008, this is where Bradley really broke on to the world scene with a convincing performance to startle the champion and rip away his title. This was to be the start of a successful run within the Super Lightweight Division and with the likes of Ricky Hatton, Manny Pacquiao and fellow American Devon Alexander around at the time there was some exciting potential fights to be made. Bradley made the first defense of the title against tough veteran Edner Cherry and was then matched up against the well-known Kendall Holt in a bout where the WBC & WBO titles were at stake. Bradley picked up the victory over Holt thus solidifying his status as one of, if not the top Super Lightweight in the division. The great run of form continued for Bradley as he displayed his dominance over the division by defeating fellow Americans Devon Alexander and Lamont Peterson, and then capped off his final bout at Super Lightweight with a TKO victory over Joel Casamayor. The next move for Tim Bradley was up to the Welterweight division which held a hotbed of talent from the likes of Floyd Mayweather, Juan Manuel Marquez and the much-feared Manny Pacquiao. The bout with Filipino legend Pacquiao was the first time Bradley had been made the underdog for since becoming a world champion, this was solely because Pacquiao was dispatching his opponents with ease, blowing away Ricky Hatton in two rounds in 2009 and dominating and retiring the much bigger Oscar De La Hoya. Tim Bradley was not fazed but seemingly looked like he was going to pick up his first loss, however the judges favored Bradley the winner over the twelve rounds, a decision that was reviewed post fight and determined that actually Pacquiao should have won the fight, but due to the WBO rules the decision could not be overturned. A rematch between the two was inevitable. Before this rematch could happen, Tim Bradley had to overcome Ruslan Provodnikov and Juan Manuel Marquez. Bradley beat both fighters over the distance and set himself up for the Pacquiao rematch. The second bout between the two was tale of two halves with Bradley scoring the early rounds, however Pacquiao picked up in the second half and went to be the victor, thus ending the undefeated streak of Tim Bradley. Bradley returned to the ring and took on Diego Chaves of Argentina, this bout was also a controversial one with the fight being scored a draw although Bradley seemed to dominate more of the rounds and fight. The next bout was against undefeated Jessie Vargas for the WBO interim Welterweight title. Bradley dominated the fight and picked the W on the scorecards. Because of Floyd Mayweather failing to pay a sanctioning fee for his bout with Manny Pacquiao, he was stripped of the title which led to the WBO promoting Tim Bradley to full champion. Bradley would make his first defense of the title against former WBA lightweight champion Brandon Rios. Bradley won the fight by TKO in the ninth round, which set him up for the rubber match against former foe Manny Pacquiao. The third and subsequent final fight of Bradley’s career took place on the 30th December 2015 at the MGM Grand, Las Vegas. It was the rubber match to decide the overall winner in their epic and controversial trilogy. This time Pacquiao left nothing to question, knocking Bradley down in the seventh and ninth rounds on route to a points victory and ripping Bradley’s WBO crown away. So, another great fighter has made the decision to hang up the gloves and going off his comments about how he was after the Provodnikov fight it was the right thing to do for Tim Bradley. We wish him all the best in his future endeavors and thank him for providing us fans with some great moments to remember.